In this big brown country there’s nothing we like more than having a swim. Remember at school when summer would come around and whoever had a backyard pool would suddenly become the most popular kid at school? Well, having a backyard pool is a great thing, not only to spend hot days in but also as an investment for your home. But if you have a pool you need to make sure you make it a safe space. Drowning is the leading cause of death for Australian children under the age of 5 and last year over 40 people died as a result of drowning. Unfortunately, if proper precautions aren’t taken a place of fun can quickly become a very dangerous place. According to Australian law any pool, Jacuzzi and indoor pool over 300mm deep must have fence. It’s important that you follow these laws, not only as a safety precaution but to save yourself from forking out up to $5,000 in fines. You need to check that you have a clearly demarcated pool area and that the area can only be accessed via a self-closing or self-latching door. The self-latching entry point must be 1.5 metres above ground level. This level has been chosen to ensure that children under the age of five are unable to access to the fenced off pool area. When constructing the pool fence and gate you have to make sure that there are no areas where a young child could climb over the fence, so make sure the fence and the gate are nowhere near any raised areas. The law states that the fence needs to be at least 1.2 meters away from any objects that could be used to gain access by climbing the fence. The design of the fence itself also needs to be impossible to climb. So if you are using horizontal slats the beams need to be close enough together that they cant be used as foot or a handhold. The wall of a building can count as a boundary, however you need to ensure that any windows or doors facing the pool have a child resistant latch fitted to them. The self-latching gate you select must swing away from the pool; it can’t swing both ways it can only swing away from the pool. Timber fencing is an appropriate material but you have to keep on top of maintenance. Any palings that have rotted or are broken are viewed as being non-compliant with pool fencing regulations. It is incredibly dangerous and unlawful to keep your pool gate propped open, even if there aren’t any children living at your house don’t take the risk. You never know when the neighbour’s children could jump over the fence and decide to go for a swim. This checklist will put you on the right path to having a safe and compliant pool but it’s worth keeping in mind that pool regulations get updated on a regular basis, it’s a good idea to jump online and keep an eye on any changes that apply to your pool fencing. You also need to obtain a building permit before you start the process of building a pool. 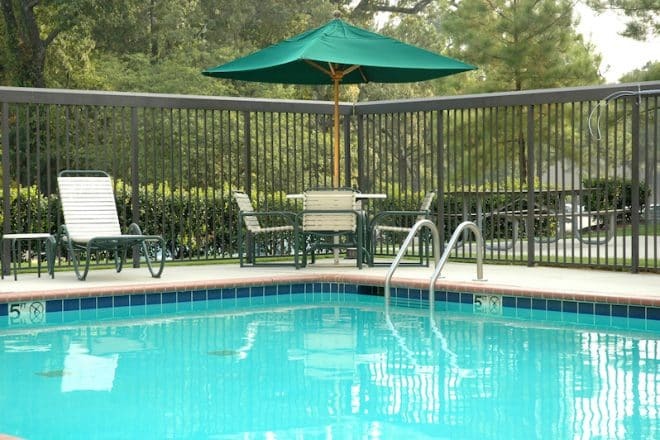 Everlast Services has been providing people with safe and compliant pool fencing for over 20 years. Our project managers make sure they stay on top of all the current regulations. We know how important it is that the laws are abided by and we never cut corners. Why Choose Everlast Services To For Your Safe and Complaint Pool Fencing Needs? Cutting corners is never an option when it comes to swimming pool fencing. You can expect us to get every element right so your fence gets the tick of approval. We have our own steel fabrication plant in Hoppers Crossing, this allows us to cut out the middleman and keep prices down. We always pass the savings directly on to you, so you get a compliant fence at an affordable price. We’ve been in the industry for over 20 years, we know how to work with your space and your pool to give you the perfect pool fencing option.